YAY!!! 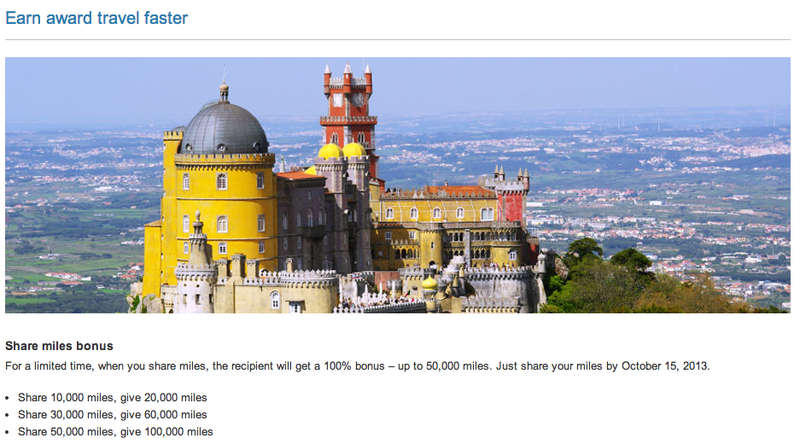 US Airways is having a 100% promo on shared miles. Share miles from October 1 to October 15, 2013 and your friend or family member will get 100% MORE in bonus miles – up to ​50,000 miles. This means miles are sold for 1.13 cents each. The best way to do this is to have a friend who already has 50,000 miles. Say your friend has 80k in is account right, you have zero. So he will send you 50k, and with the 100% promo you will get 100k in your account. Now: friend’s account – 30k, your account – 100k. If your friend wants to do the promotion as well, you send him back 50k, which means he gets 100k. Now: friend’s account – 130k, your account – 50k. OR if he only wants just his miles back, you send him 25k and with the promo he gets 50k back. Reminder: These purchases are processed by points.com which means no category bonus on spend. Accounts must be open for 12 days so if you don’t have one open one now! Miles are shared for $0.01 per mile plus a processing fee of $30 and a tax recovery charge of 7.5%. GST/HST will be charged to Canadian residents. Miles purchased through Buy, Share or Gift Miles do not count towards Dividend Miles Preferred status. All other Dividend Miles Terms and Conditions apply. Miles may be used based on award availability at the time of booking. Please note that Dividend Miles accounts less than 12 days old are not permitted to Buy, Share or Gift miles. All purchases are non-refundable. Offer valid for Share miles transactions made between September ​30​, 2013 00:00:01 PT and October 15, 2013 23:59:59 PT. Members may receive a maximum of ​ ​50,000 bonus miles during the offer period. This bonus is only applicable for Share Miles and the offer does not apply to Buy or Gift Miles transactions. Bonus amounts will be awarded upon completion of the transaction. ​ ​All transaction inquiries must be submitted to US Airways Dividend Miles within 90 days from end of promotion. Bonus miles will be awarded to the recipient of the Share. Offer is subject to change. Offer cannot be combined with any other offer. Only purchases made online are eligible. All US Airways Dividend Miles terms and conditions apply. Visit usairways.com/dividendmiles for details. Curious though…who pays the fees? The friend pays first when sending miles, and then you pay again when you send back the miles? When my friend transfers the miles to me, he “pays” for my miles. When I send the miles back, I “pay” for his miles. Since we both get 50k each, we pay for each other which is fine. Yes, you can do unlimited sharing, but receiving limit is 50k. Do you know if both accounts (person receiving and sharing) have to be open for atleast 12 days?